Almost Famous is a classic film that is one of those that you just have to watch in order to fully get the magic of it all. It just tells such a beautiful tale of a boy who loves music and writing, while at the same time he’s growing up and figuring his way through life. This movie has something for everyone: good music, unique story, humor, romance, family, and much more. William Miller (Patrick Fugit) is a 15-year-old graduating high school who dreams of becoming a rock journalist. He turns to the outspoken rock journalist Lester Bangs (Phillip Seymour Hoffman) who gives him an assignment to cover a Black Sabbath concert. He then meets the opening act Stillwater who at first hesitate to let him in, but the guitarist Russell (Billy Crudup) takes a liking to him and takes him under his wing. He also meets a groupie (Kate Hudson) who he quickly falls in love with despite her romance with Russell. William gets an assignment from Rolling Stone and goes on the road with the band and writes an in-depth feature story about them that may make the cover of the magazine. The story is actually based on Cameron Crowe’s own experiences growing up. Like William, he also graduated high school at a young age and he also wanted to be a rock journalist. Crowe went on the road with bands like: Lynyrd Skynyrd, the Eagles, The Allman Brothers, and Led Zeppelin. This is important information when you look at the story of the movie. It almost makes it all the more magical and fascinating when you realize that the writer/director had a similar experience to William. I think the writing from Crowe was very well done and while there are other films out there about bands going on tour, this experience is still unique because of the characters and plot. Kate Hudson received a lot of rave reviews for her role as Penny Lane, the groupie who denies being a groupie and instead says that she and the other girls are people who love music and they call themselves “Band-Aids.” They don’t follow the bands just to sleep with them, they want to hear the music first and foremost. I think Hudson did a great job playing this role, she was charming and also a strong character all at the same time. Patrick Fugit did a really awesome job as the awkward yet determined young main character. Yes, William is a little bit whiny but I think that shows that Fugit captured the teen angst and weirdness of the character as he tries to find his place in the world. Frances McDormand was also hilarious in the supporting role of William’s strict mother who tries to shelter him from many things including his real age (he always thought that he was older than he really is) and rock music (which she thinks is devil music) in a hilarious fashion. Phillip Seymour Hoffman was also brilliant in his part as Lester Bangs, the rock critic who is convinced that music is dead. He goes on many rants about the state of music today that always make you laugh. This is one of my favorite roles of his because he truly captures everything about this character and makes us feel all the emotions of Lester Bangs. Cameron Crowe has had his ups and downs as a director over the years. He’s had several critically acclaimed films but he has also had several not so great films as well. However, this one is one of the more notable films of his and also the only one he won for his writing. As for his directing itself, his style isn’t exactly unique but it still shapes the film the way he wants it to be. Honestly, there isn’t too much about it that manages to stand out all that much, but there are several filming decisions such as filming most of it on the tour bus, that are subtle but important. 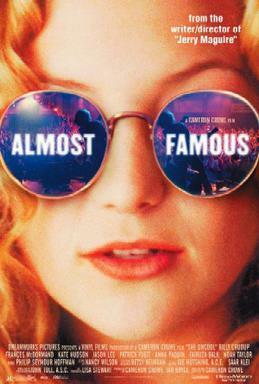 Almost Famous was just one of those films for me that instantly stuck. I love the soundtrack, especially some of the scenes that work music into it in the most natural and memorable ways. For example, there is one scene on the tour bus where “Tiny Dancer” by Elton John comes on and the whole bus joins in to sing along. You won’t be able to listen to the song without thinking about this film again, I promise. Anyway, this is a fun and incredible film and it’s one of my all time favorites. Maybe it won’t be yours, but it is still one that demands to be watched a time or two.